Over the years the Star Wars saga has been know for it's ability to make stars out of previously unknown actors. Back in 1977 A New Hope made actors such as Mark Hamill and Carrie Fisher almost instant household names. Now, almost 40 years later, Star Wars is still working it's magic on a whole new generation of talent. 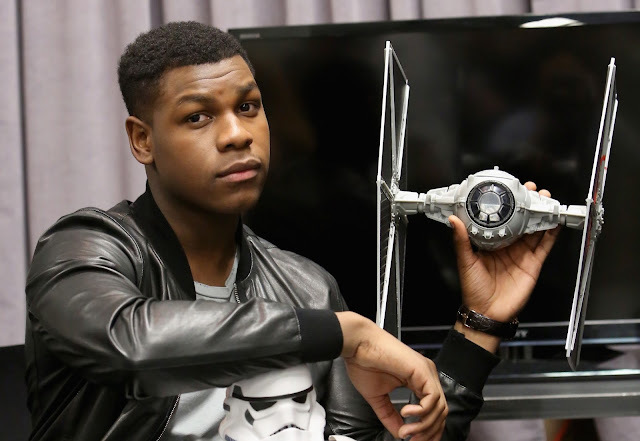 John Boyega, who plays Finn in The Force Awakens, was just beginning to gain some notoriety from his role in Attack The Block when he was cast in Star Wars. He has since become a huge name in Hollywood and already has a starring role in next year's The Circle alongside Emma Watson and Tom Hanks. Now it appears the San Diego Film Festival, which is set begin next week, will be honoring Boyega's recent achievements with the "Rising Star" Award at the annual event. Boyega will be presented a trophy on October 1st at Variety‘s "Night of the Stars" Tribute that will be held at the Museum of Contemporary Arts in La Jolla, California. Brit Marling, Adrien Brody and Geena Davis will also be presented with awards at the ceremony. The San Diego Film Festival is set to take place from September 30th until October 4th.